The KF21 battery can power 28.8V (20-34VDC) applications. Run time for Kino Flo products listed above is approximately 1 hour and 10 minutes at full brightness. When fixtures are dimmed, the battery will last longer. Charge time is only 1.5 hours versus Lithium batteries that take approximately 4 hours to fully charge. Unlike lithium batteries, the Kino Flo/BlockBattery is also travel friendly with no travel restrictions BlockBattery Travel Documentation. In addition to powering 28.8V, battery adapters may be used to access 14.4V to be used with products with 14.4V input. It’s like having two batteries for the price of one! The Single Channel Fast Charger utilizes BlockBattery’s advanced microprocessor system and multi-level charge routines to quickly & safely, qualify, initiate and terminate charging of a nickel metal-hydride (NiMH) battery. 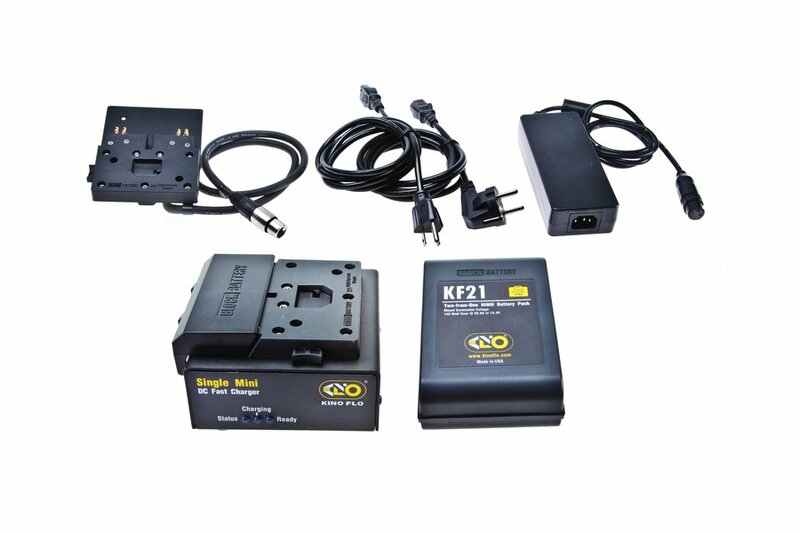 It is designed to charge one Kino Flo/BlockBattery, BAT-KF21. The Charger System, BAT-BC1U, includes a Single Fast Charger and universal power supply, 120W/48V with 3-Pin xlr. Charge time is 1.5 hours. Charge cycle is complete when all 3 LED’s are on steady. Note: For best long-term performance, avoid interrupting charge cycle during fast charge. Avoid “top-off” charging a full battery just before use. This is unnecessary and could elevate the voltage above equipment operating ranges and/or damage equipment being powered.